Yo-kai Watch tells the story of Nate (or Katie) and the fateful summer afternoon when he stumbles upon a talking gashapon machine. Intrigued by the mysterious voice asking to be fed, Nate inserts a coin and cranks the machine. Yo-kai Watch also tells the story of how to dethrone Pokémon. He’s greeted by Whisper, and soon everything that used to be normal isn’t anymore. The ghost like figure explains to Nate that the problems he encounters every day are caused by these mischievous spirits that wander the world and although they’re invisible to the human eye they live amongst us. Whisper, just like any good salesman, convinces Nate to wear a nifty little gadget called the Yo-kai Watch “Wearing it makes the impossible…possible”. 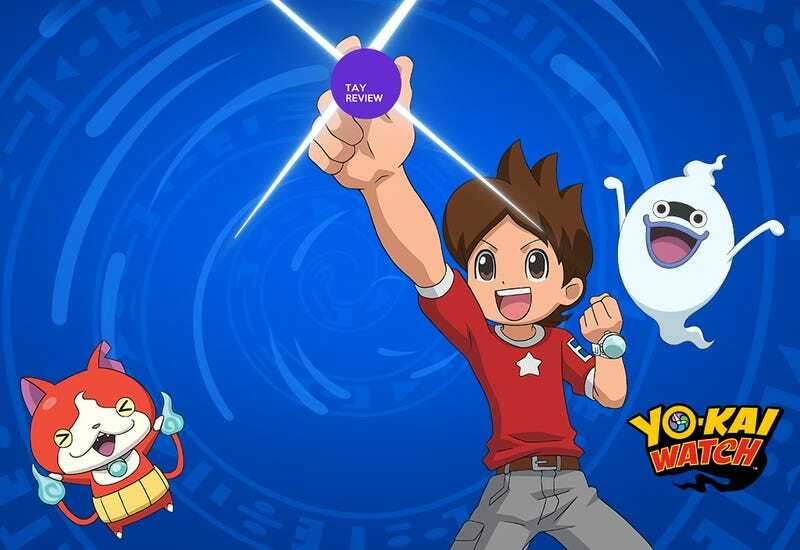 Simply put, Yo-kai Watch was always designed to become the huge success it is today, in the words of Yo-kai butler himself, Hino and the rest of the crew at Level-5 made the ‘impossible…possible’ - To dethrone Pokemon and every other franchise available and become the king. That was over three years ago, and Yo-kai Watch is now stronger than ever in its native Japan. Nintendo took the opportunity and finally brought the successful franchise to the West, but with the cultural differences and seeing how the series is influenced by Japanese folklore, can Yo-kai Watch start another phenomenon similar to the one we had in 1998? It’s easy to compare Yo-kai Watch and Pokémon, they have similar roots and it could be argued that the main mechanics are similar. But that’s where I shush you and say “Yo-kai is not Pokémon”. Yo-kai Watch main focus isn’t battling, nor is collecting these spirits-like creatures, instead it focuses on one simple thing: The world as seen through the eyes of a kid who is eager to help everyone. A world where nothing is impossible and every single problem has a simple solution. The game treats these problems, whether they are mature or childish, and brings a new light to them. It may sound ridiculous but the series is focused to teach kids how to contribute to their society by helping everyone solve their problems. I’ve never played a game that is as naive as Yo-kai, yet it is incredibly charming that even mundane situations like crossing the street, or going out at night gets a unique twist in Yo-kai Watch. Not only that, but the way Yo-kai solves these situations is admirable, only when a situation cannot be solved because a Yo-kai is being reluctant to stop their misbehavior or because there is a superior evil force pulling the threads, that’s when the game resorts to start a battle. Sure you could argue that to capture the creatures you have to engage them in battle, but there are many instances in the game where they join you just because they wanted to be loved by someone. Yo-kai Watch’s goal is a bold one, and it excels at it. In more than one occasion it led me to recall those moments where I struggled to understand the world as a kid, and how could that situation could have been easily solved through the power of Yo-kai, not the creatures, but the wisdom infused in the series. Yo-kai Watch is comprised of several chapters that play pretty much like a season-long arch of your typical anime show. The game starts little by little introducing the protagonists of the story and sooner rather than later they’re tackling behemoths of beasts causing problem in the town of Springdale. It was incredibly touching the first time I was wandering around the residential district of Springdale to find an abandoned building standing in the middle of the map. My Yo-kai radar informed there were some strong Yo-kai in the vacant apartments, as I explored out of curiosity (the same reason I explored buildings as a kid) I found a family in disarray due to bad investments. I was shocked to say the least, and strangely enough there were no Yo-kai in the area to put the blame on, nor I had anything in my group of “friends” to help them. In some way the game was teaching me that not every situation can be solved easily, yet when you talked to the members of the family they were incredibly optimistic. It is safe to say that this isn’t a unique case in the game. Heartbreaking moments in the game are a norm, yet there are many instances where you can help Springdale flourish with happiness, be it because you talked to someone that needed to express his/her voice or solved one situation with the help of Yo-kai, the results can be heartening and in some cases, hilarious. Whether you’re exploring the caves to the north of the city, an abandoned hospital or even the swimming in the sewers, the multifaceted city will always offer you an invigorating challenge. You see, these nasty creatures have the ability to inspirit people. To be inspirited means to behave like an idiot for nor reason - Yo-kai can make people grouchy, careless and overly optimistic. People are simply expressing the personality of the Yo-kai who has inspirited them. Just like Jibanyan up there, each of the 236 Yo-kai feels unique. They all react different to food, some of them loaf in battle while others cower in fear. They all have their own unique traits, elemental alignment and stats, and every one of them comes with their own Soultimate attack. Furthermore some Yo-kai can fuse with each other to create different variations of the same creature. In a world where Pokemon has already a library of 718 Pokémon, of which many feel uninspired, the guys at Level-5 put a lot of effort to give every creature a unique feel and look. Of course all these different situations and exuberant personalities won’t get their moment to shine if the game itself is boring, thankfully Yo-kai Watch brings at least one feature to differentiate itself from the rest of the games in the genre. The game itself doesn’t break new grounds when it comes to the concepts and mechanics that make the clock tick. At its most basic, Yo-kai Watch is just another JRPG with an incredibly ambitious albeit simple battle system. Battles in Yo-kai Watch take place in real time, but here’s the catch, Yo-kai are sentient creatures and don’t exactly follow orders. As a consequence you don’t have direct control of the flow of the battle. Yo-kai will attack, use special attacks, loaf and cower themselves in fear as they see fit. It wouldn’t be an entertaining game if you had to sit there and watch a two tailed cat scratch his opponents, and thankfully you have a few tools at your disposal to help the battle flow a bit faster. First of all, while you cannot control the actions of the Yo-kais you can arrange how they’re going to battle. You see, in your watch you have six medallions, three on top and three on the bottom half. The Yo-kai on the upper half are the ones who are ready to battle and the ones you have on the bottom half are just warming the bench until they’re summoned. Furthermore certain Yo-kai have better chemistry when working together giving you special bonuses when you pair them up. You can tell your Yo-kai which enemy they have to focus their attacks on, give them food to fill up their soul level or simply restore their HP and you can also trigger their Soultimate attacks through a variety of touch screen mini-games. And last but not least, in case your Yo-kai gets inspirited and feels a bit under the weather, you can put the on the lower side of the wheel and purify them. I have to admit, I wasn’t a huge fan of the battle system at first, as a matter of fact, I didn’t began to appreciate them until I encountered a boss battle. Boss battles in Yo-kai Watch changed my perception of the battle system. They’re simply out of this world. Bosses in Yo-kai Watch are brainy and colossal creatures that require your constant input and attention. Simply attacking bosses won’t cut it, specially during later bosses when it is imperative to have balanced teams who can take care of themselves. So You Want Me To Get You All These Items? Do you like fetch quests? Cause there are many. As a matter of fact around 50% percent of the main campaign is riddled with disguised fetch quests. And it’s safe to say that most of the sidequests are fetch quests, so for most part of the game you’re going to be traveling from Point A to Point B to deliver goods to the citizens of Springdale. It can get a bit repetitive, if only the situations weren’t as hilarious as they are. Sidequests can range from giving courage to a cowardly kid, to helping a college student become a hooligan, and sometimes yes… sometimes fetching the undies of an old man. There are moments in the main campaign where you’ll encounter one of these gates with a letter inscribed in it. These are called rank gates, and there is no way to bypass them unless your watch is in the appropriate rank. In two different situations I had to deviate from the objective to rank up my watch. And to rank up the watch you need to take on completely different challenges that are possibly in the opposite corner of the city. I don’t mind these gates existing in the game, they help separate the challenges and avoid a amateur player stumble upon overpowered creatures, but if you’re going to implement them in the main campaign just for the fact of extending the play time, well thanks but no thanks. Ranked gates wouldn’t be so bad if the requirement to rank up your watch was to track very specific Yo-kai. Just the fact that I have to stop and search in a very particular area of the map to look for hidden Yo-kai makes the whole method tedious and boring. There were instances where I just simply didn’t bother to look for a Yo-kai cause I know the creature that appears in the screen is incredibly slippery and annoying to pin down. Remember the Safari Zone in Pokémon? Remember how difficult was to capture Chansey because that fool wouldn’t even get distracted with the food you threw? Remember how the Safari ball is the worst ball since the original poké-ball? Let’s say you want to befriend a Yo-Kai so you can later use him either to solve a sidequest or because you thought it looked cool…. Well, good luck! The whole process of getting a Yo-kai to join your party is as jarring as the whole Safari Zone gimmick in Pokémon, actually, it is worse than the Safari Zone, because the Safari Zone is just one small portion of the Pokémon titles, befriending a Yo-kai is the only gimmick in the game. And being the main mechanic (besides battling and helping people) it should be accessible and easy to understand, but apparently there’s a random algorithm in the game that dictates the chance of recruiting one of these ghost-like creatures. The game tells you that in order to befriend a Yo-kai, you need to feed it while in battle. Now feeding the Yo-Kai isn’t the difficult part, because food is the one thing that will never be scarce in the city of Springdale. There’s a caveat, you can only feed a Yo-kai once per battle, so if there’s the chance you gave the Yo-kai the wrong snack cause your finger slipped, well… time to search for that Yo-kai again, or maybe not, cause it’s all random. I have fed a Yo-kai a piece of food he detested, and at the end of the battle he asked me if he could join my ranks. More often than not battles are against a trio of different Yo-kai, and in these battles I’ve fed a certain Yo-kai his favorite piece of food only for another completely different Yo-kai to offer his services at the end of the battle. I’ve fed a Yo-kai his favorite food only to get no request at the end of the battle, it’s specially frustrating when that particular Yo-kai is difficult to track down. There was even a case when I fed nothing to no one, and yet I got a request, only because the Yo-kai liked me. Remember how difficult is to befriend a Yo-Kai? Yo-kai Watch is an incredibly charming yet flawed adventure. When it shines it truly shines, but the issues with the uncertainty of the befriending mechanic, the cumbersome method of tracking Yo-kai and the sometimes difficult to read map take away from the brilliance of what makes the game click. If you’re looking for a unique experience on your 3DS, then don’t think twice, there’s enough content in Yo-Kai Watch to keep you busy for weeks, and the fact that Nintendo is planning to distribute more content online makes it an even sweeter deal! The three year wait is over, now let’s get inspirited by the Yo-kai! Follow Nach on twitter at @Nach212. When he’s not failing at befriending a Yo-Kai he’s probably busy talking about food or music. You can read his other articles here.